Save time and money with a fully maintained, tax-deductible Managed Washroom Service. Fresh & Clean’s feminine hygiene service is designed to provide maximum comfort for your female employees and customers. Fresh & Clean’s rental program takes the headache away, giving you peace-of-mind. It even takes away the financial burden of capital outlay and depreciation, replacing it with a tax deductible service. Our research revealed women preferred a lift lid that requires minimal contact and allows for discreet sanitary disposal. Which is why the Fresh & Clean sanitary bin has been designed to offer women a more user-friendly disposal method. Its smart, lightweight lift lid is both convenient and easier to use. Women wanted the units to have a modern, sleek black look which gives the impression of the units being cleaner too. The lower height makes it more comfortable for women to reach. Plus, the compact design means they are no longer ‘too close for comfort’. The units are lightweight, allowing them to be wall-mounted. Hygiene is womens’ number one concern when using sanitary disposal units. Fresh & Clean’s units have been cleverly designed so that they are 100% sealed. The lid and the bag form one single component which is biodegradable and can be easily disposed of together. 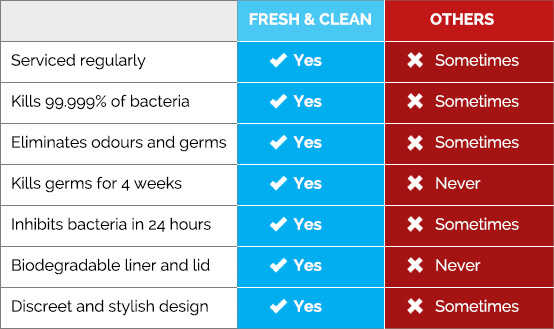 Which makes it more hygienic and more appealing than other units. Why are Fresh & Clean’s Feminine Hygiene Units better than the rest? Women told us they wanted units that are not only hygienic, but smell hygienic too. 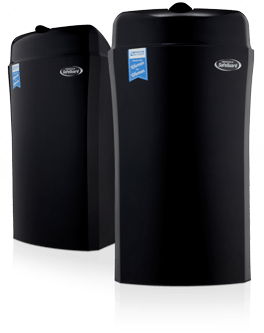 By delivering a unique dual-action to eliminate odours and bad bacteria, our unit offers a fresh new approach to sanitising. Unlike other units, which rely on contact with a germicide, Safeguard® vapours permeate throughout the unit and sanitise every surface. This ensures Fresh & Clean units can effectively sanitise, even when they are full. Make your washroom a more hygienic environment for your staff and customers.